Clock Repair Course DVD video. Learn to repair antique clocks with course manual. Home Page-to find other clock repair courses. 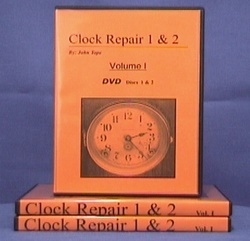 The clock repair course consists of 2 volumes for a total of 4 DVD discs playable worldwide. Total course running time: 4 hours and 21 minutes. A detailed 38 page instructional repair manual is included. The price is $99.95. Shipping is FREE to anywhere in the World via United States Postal Service. Beginner antique clock repair course. If you want to enjoy antique mechanical clocks as a hobby, repair your own collection or start a business of repair and restoration of clocks, this 4+ hour program of detailed instruction is for you. No previous clock repair experience needed. New 2010 expanded third edition is better than ever! Filled with more information than the previous 2 editions. This course was designed for the beginner, but also has much to offer to a seasoned veteran of antique clock repair. There is no other clock repair DVD or video course available with this amount of instruction and detail. All lessons are filmed in high quality digital video with an easy to follow step by step approach guides you quickly through the basics and through intermediate level repairs. More than just cleaning and servicing the movement. This course includes many details, techniques and tips not normally covered or explained in other books or tapes. No more confusing and hard to understand books and manuals. See and understand with close up shots of actual clock repairs. Learn with minimal and common tools. Many of the tools are adapted for clock repair from everyday ordinary tools. Not a lot of expensive equipment. This clock repair course consists of 2 volumes for a total of 4 DVD discs playable world wide. Total course running time: 4 hours and 21 minutes. There is a detailed 38 page repair manual full of additional tips, illustrations and diagrams. Also a 4 page DVD/video program outline is included for going back to segments you may need to review. All tools, materials, and equipment used in this video course are listed in the manual for easy reference to model, make, price, and where they can be purchased. Go to the testimonial page to read the responses from other students about these courses. Click here to view, print or download the full course outline, glossary and clock diagrams. Don't want DVDs? Want instant online access? NEW 2018 SPECIAL!! STARTING TODAY!! Buy any 3 or more DVD courses and receive unlimited access to the online library with over 100 books and videos! Beginner antique clock repair course on DVD or video with course manual. Learn with antique clock repair. Home study clock repair course on DVD.